Just north of the iconic red columns of the Golden Gate Bridge lies another beloved local landmark: Mount Tamalpais. A bit of a geographic anomaly, Mt. Tam, as it is known to locals, does not follow the same north-south alignment as California’s coast ranges. Instead, the mountain’s ridgeline begins at the Pacific Ocean, reaching 2,500 feet at the apex of its three main peaks, before gracefully sloping back down to the shores of the San Francisco Bay to the east. The mountain’s peculiar orientation, varied topography, and proximity to a major marine upwelling zone on one side, and a large estuary on the other, have created a confounding array of microclimates in a relatively small area. Combined with a wide range of soil types, these conditions have yielded unique plant communities that are home to several rare and endemic species. The mountain offers a welcome dot of green and blue for migrants traveling the Pacific Flyway, and is the southern range limit for the endangered Northern Spotted Owl. In addition to its own inherent ecological values, Mt. Tam is a critical link in a larger regional network of open spaces, a natural refuge in a highly developed metropolitan area, and a source of drinking water for almost 200,000 nearby human inhabitants. While Mt. Tam’s plants and wildlife live in protected open spaces, their health is threatened by climate change; altered fire regimes; invasive plants and animals; habitat fragmentation; plant diseases; noise, light, and air pollution; recreation pressures; and other human impacts. That Mt. Tam’s 36,000 acres of open space exist right on San Francisco’s doorstep is a testament to the remarkable foresight of early local conservationists. However, like many protected areas, these lands were not set aside all at once though a single, sweeping act. Rather, the mountain’s patchwork of open spaces reflects the often opportunistic nature of land conservation, as well as various historical fluxes in environmental ethics, population pressures, and politics. As a result, the public lands on Mt. Tam are managed by four different agencies: The Marin Municipal Water District, National Park Service, California State Parks, and Marin County Parks. In 2014, these agencies came together with the non-profit Golden Gate National Parks Conservancy to form the Tamalpais Lands Collaborative (TLC). The TLC was formed to offer a more unified approach to priority conservation and restoration projects, coordinate education and volunteer programs, and increase volunteerism and stewardship on Mt Tam. One Tam, the public engagement initiative of the Collaborative, followed very shortly thereafter to help galvanize community support for this work. How Do You Measure the Ecological Health of a Mountain, and Whose Ruler Do You Use? As the partnership began to delve into their collective conservation and stewardship goals, it became clear that a baseline understanding of the mountain’s overall ecological heath was needed to help inform their mutual priorities and to articulate a clear case for public support. The effort was led by a small team of One Tam partner staff and a representative from Point Blue Conservation Science—a key bird monitoring partner. Dubbed the Health of Mt. Tam’s Natural Resources Advisory Committee, team members were specifically chosen who represented a range of biological expertise. The group was kept intentionally small to increase its efficiency and reduce the burden on agency resources. While this approach achieved those goals, it should be noted that the time commitment for Committee members was significant. Create scientifically based, clear, and engaging public communications tools that distill a great amount of complexity and nuance in a way that accurately represents the status of the chosen ecosystem health indicators. As is often the case with great advice, some of these things are more easily said than done. One of the first challenges arose with the recommendation to “base the initial report on existing data.” Collaborative data gathering and management had only recently begun to take shape among the One Tam partner organizations. Although there had been some joint projects in the past, distinct agency priorities, missions, and budgets meant that they largely conducted their monitoring, inventories, research, and data management independently. Using existing data meant finding ways to rectify information at different levels of detail, collected over different time scales using different protocols, and maintained in different formats and locations. The Advisory Committee decided that this situation lent itself to a health assessment methodology similar to the National Park Service’s Natural Resource Condition Assessments, which rely on existing information to assess trends, conditions, and threats, but also allow for varying confidence levels and identify critical information gaps. The next challenge was to decide what constituted “meaningful and measurable” health indicators for Mt. Tam. The Committee began by creating a comprehensive list of natural resources that could potentially act as indicators. They then painstakingly gathered all available existing information for each one, and organized it into combined databases and bibliographies. This aggregated information was distilled into summary worksheets, which were refined during a day- long workshop attended by about 40 staff scientists. Once vetted by internal experts, revised summaries were used for two additional workshops that brought together a total of 60 local academic and agency scientists. Attendees were tasked with reviewing and making recommendations on metrics, goals, condition, and trend statements; discussing existing data; sharing their expert opinions; and identifying missing information. A subset of the initially proposed indicators was then selected based on this feedback. One of the revelations that came out of this process was the myriad ways there are to look at ecological health. The final report included individual species, guilds, communities, and entire ecosystems. The indicators that were ultimately chosen were those that were measurable, had relatively low amounts of data noise, and revealed something about other aspects of ecosystem health. Most importantly, they also had sufficient information or opinion consensus to set metrics and assess condition and trends. Where there were gaps or unevenness in existing data among the agencies, best professional judgment was used to make an assessment, and areas of uncertainty clearly indicated in the report. The way the health assessment process was structured, the format and scope of the final report, and the resulting communication products were driven by the initial goals of this process: Understanding the health of Mt. Tam, identifying information gaps, and raising public awareness and support. 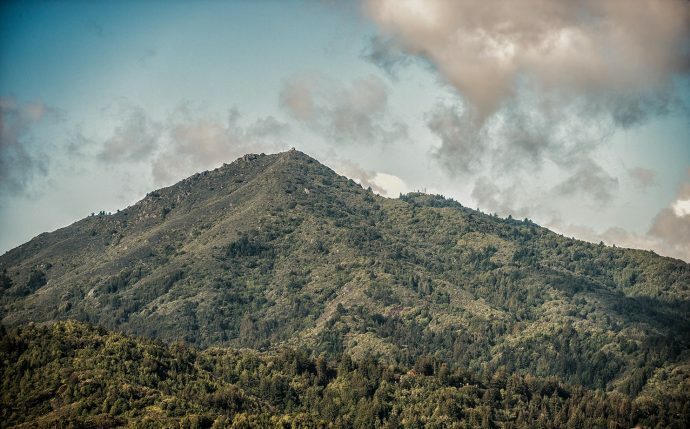 Completed in the fall of 2016, “Measuring the Health of a Mountain: A Report on Mount Tamalpais’ Natural Resources” has already helped managers understand how and where to collectively focus their monitoring and research efforts and to implement shared data collection and management practices. The One Tam partners have also used their improved understanding of where their biggest data gaps lie to better align their budgets to coordinate support towards meeting these common needs. To make the report’s findings accessible and compelling to a wider audience, a distilled version of the findings were made into an interactive web dashboard where users can drill down through increasing levels of detail to learn about the health of the resources that they are most interested in. The website is complimented by a summary video and a brochure created to entice people to explore and learn more. A two-day symposium on the report’s findings was also attended by hundreds of members of the public as well as the local scientific and conservation communities. Looking back on this process and its outcomes reveals real challenges and complexities in undertaking a broad, collaborative ecological health assessment such as this. However, the payoffs for investing the time to bring together managers and scientists are the huge improvements in understanding the state of the resource, the ability to use this information to define collective needs and coordinate management efforts, and having the tools to help meet the significant public appetite for information about how they can support the health of the open spaces they love. For more information about this project please visit http://www.onetam.org/peak-health or contact Sharon Farrell.